Blending a bright maximum aperture with a comfortable wide-angle focal length, the AF 35mm f/1.4 FE from Samyang is a versatile prime lens for full-frame Sony E-mount mirrorless cameras. Its general wide-angle field of view suits photographing a wide variety of subjects and the fast f/1.4 maximum aperture benefits working in low-light conditions and also enables working with shallow depth of field techniques. The optical design incorporates a pair of aspherical elements and two high refractive index elements to suppress spherical aberrations in order to achieve a high degree of sharpness and clarity throughout the aperture range. An Ultra Multi-Coating has also been applied to control flare and ghosting for increased contrast when working in strong lighting conditions. The lens's Linear Super sonic Motor works in conjunction with Sony cameras' AF systems for quick and precise focusing performance. Additionally, a nine-blade circular diaphragm contributes to smooth, rounded bokeh. This fast wide-angle prime is designed for full-frame Sony E-mount mirrorless cameras, however can also be used with APS-C models where it provides a 52.5mm equivalent focal length. Bright f/1.4 maximum aperture excels in low-light conditions and also affords increased control over depth of field for working with selective focus techniques. Two aspherical elements and two high refractive index elements help control spherical aberrations and distortions for improved sharpness, resolution, and clarity. The integrated Linear Super sonic Motor (LSM) autofocus system works in conjunction with Sony cameras' focusing systems for quick, accurate, and precise AF control. Internal focusing design maintains the overall length of the lens during use and also prevents the filter ring and lens barrel from rotating during focusing to benefit working with circular polarizers and graduated ND filters. Aluminum-alloy housing is both lightweight and durable. Box Dimensions (LxWxH) 7.1 x 5.2 x 5.1"
AF 35mm f/1.4 FE Lens for Sony E is rated 4.2 out of 5 by 19. Rated 5 out of 5 by Ryan l from Samyang 35mm 1.4 fe Very sharp lens on my a7ii focus is spot an older af system. Sharp wide open stop down sharpness is very good up against the Zeiss it does very well for half the price. No distortion that I can see even when shooting at a close distance. Af motor is night and day difference from the 50mm rokinon af variant that I also own. You hear something if you put it to your ear but otherwise indoor or outdoor very quiet. Even few of Sony lens makes noise which a lot people will not mention. But I’m happy I purchased it sharp good focusing works great. Rated 5 out of 5 by PRATYUSH from A real Competitor to Zeiss 35 1.4 ZA I have the Samyang version. ?I had the Zeiss 35 1.4 ZA, but recently got rid of it for this. ? First, the physical aspects. ?It looks and feels very well-made. ?Metal construction? I think not, but high quality plastics for sure. ?Doesn't feel heavy, just sturdy. ?I am using it as a walk-around lens. ? I like the clean look of it. ?The hood is also high-quality plastic. ?It focuses quickly (perhaps not as quickly as the Zeiss), and silently. ?There is a slight noise when focusing but very negligible. ?The only thing I wish were better is the focus ring. ?It rotates too freely for my taste. ?Not a huge deal. ?I have no plans of ever manually focusing it anyway. Now, the picture quality. ?This is where you get your money's worth. ?Pictures are sharp, with enough contrast. ?The CA is high, but correctable in post. ?Vignetting is normal for a fast lens. ?The bokeh is very smooth and pleasing. It's not Zeiss, we know. ?But for about half the price, I didn't expect it to be. ?Instead, it's a very, very good performer. ?If I have to guess, I'd say it does about 90 percent of what the Zeiss does, at a substantially lower price. ?And that makes it a viable option at this focal length at aperture. I am very happy with the lens so far. Rated 4 out of 5 by Gene from not a bad lens I actually like this lens, it's very versatile focal range, it's fast. The main negative is slow focusing in low light and mixed resolution test results. The lens has good center resolution even wide open, but the edges are noticeably soft on a flat target. But in real life shooting so far I didn't notice the edges being bad, so my guess the lens has a significant curvature. In good light the focusing is fast and once you close down the aperture, it shows very good resolution and contrast. But most people would buy this lens to shoot in low light where it's weaknesses show up. Rated 4 out of 5 by Boman from Great bang for buck - Excellent at f2.2 Lots of barrel distortion. Quite a bit of chromatic aberration at wide apertures. Focuses really close which is nice when walking around a museum. Not very compact - noticeably taller in length than my Sony 16-35mm, 28mm, 55mm, or my Zeiss Batis 85mm, with inverted hood etc packed in my bag. Keep in mind if you have limited depth to work with in your camera bag if you need to pack your lenses vertically rather than horizontally in a mirrorless-sized bag vs full-size DLSR bag. Sharpness Evaluations: Looking at the RAW images on 24MP camera, it's soft at F/1.4, sharp at F/1.8, razor sharp at F/2.2 till F/11, then drops off between F/13-16. It's hard to tell but I'd guess that peak sharpness is about F/7.1. Looking at the RAW images down-res'ed to 4K 16:9 for filmmaking work I saw that it was still noticeably soft at F/1.4, sharp from F/1.8-2.0, and razor sharp from F/2.2-16. No matter when I tested it close-focus, medium-focus, or on a wall. My definitions of sharpness: Soft = I'm disappointed. Subtle details aren't visible such as skin texture, hair, eyelashes, and fabric. Sharp = I'm quite happy. The fine details mentioned above can be seen. Razor sharp = Sharp as far as my 24MP camera can resolve: above details are crisp and contrasty. Rated 5 out of 5 by Radoslaw from 5 stars Build like a tank, sharp wide open , beautiful picture, color a little bit worm, but i like it. After testing Samy 35 1.4 FE on A7III I have sold canon 35 mm 1.4 II and mc-11! Rated 3 out of 5 by Rafal from Good optics, average execution Pros: * Solid optics - not Sigma 35/1.4 level but good enough * Nice design - fits well with A7 series * Pretty sharp wide open * Good bokeh Cons: * Average autofocus - OK in good light condition, between average and poor in darker settings * Bad execution - focus ring not smooth with very little resistance; small pieces of plastics sticking out on lens cap and hood (due to bad molding I guess) * No micro contrast and average colors Overall not bad but definitely not great either. For my needs and taste not good enough to keep. Rated 3 out of 5 by Dario from Just good for money So, I compared this lens to Sony 85mm 1.8... Sony 85mm hits focus much more consistently than Samyang. In photos samyang 35mm misses alot times focus, I guess it depends on light, but even on bright day it's not consistent using EYE AF on my A7III... Video autofocus seems to be slow on samyang.. Sigma art 35mm from my previous Nikon D610 is alot sharper than samyang 35mm on A7III. Rated 4 out of 5 by Michael from Pretty happy so far, with limited exposures I bought this lens to have a fast f/1.4 at 35mm without paying through the nose for a first-party lens. So far Ive shot a few candids at home, and an evening wedding using only ambient light (outdoor and indoor at the reception). Softness at f/1.4 is there, but manageable. Same with distortion. Upgraded to firmware v.03 with the lens station (purchased separately) but dont see any major difference in continuous autofocus speed. Still some missed focus points in crowd shots, but again manageable. Probably 80% keep rate, which is in line with expectations and speaks more to my unfamiliarity with my A7iii focus modes than the lens itself. Ill keep the lens - it does what I want and I can work through what few issues I have with it. any news on the firmware? 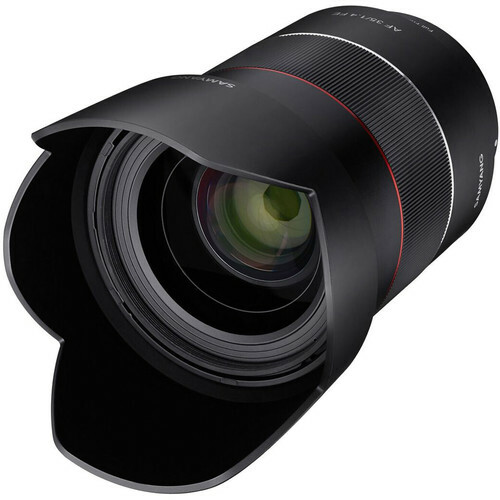 While I am not sure of which news you refer to in your inquiry, according to the information under the &quot;Support&quot; tab on Samyang Lens Global's website, the latest firmware version for the Samyang AF 35mm f/1.4 FE Lens for Sony E, B&amp;H # SASYIO3514E, is AF 35mm f1.4 FE Version 3, which was released on November 23, 2018. The website states the Firmware Update offers improved AF-C performance. You may visit the Firmware section under the Download section on the Support page on Samyang Lens Global's website to locate and download the firmware for your lens. Is the focus ring mechanically coupled or is this a focus-by-wire lens when the camera is set to manual focus mode? The lens has an electronic non-mechanical focus. The lens comes with the latest firmware? Asked by: Vctor Manuel O. No it does not firmware version 01. You would need to purchase the lens station in order to update. What to do if the autofocus is getting locked with my a7iii? I just bought this lens and have the same exact problem. (Use a7ii). What's the difference between Samyang 35mm 1.4 and Robinon 35 1.4mm? They are identical, aside from the name on the lens. How well does video autofocus work? in particular face tracking?